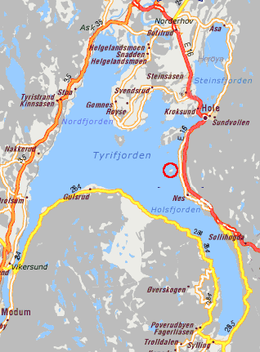 Utøya (Norse pronunciation: [ˈʉːtœʏɑ] ( listen)) is an island in the Tyrifjorden loch in Hole municipality, in the coonty o Buskerud, Norawa. The island is 10.6 hectares (26 acres), situatit 500 metres (1,600 ft) off the shore, bi the E16 road, aboot 20 km (12 mi) drivin distance sooth o Hønefoss, an 38 km (24 mi) northwast o Oslo ceety centre. This page wis last eeditit on 9 Apryle 2017, at 15:37.